All the romance of a new marriage, and the many little tales that go along with that and a budding career. 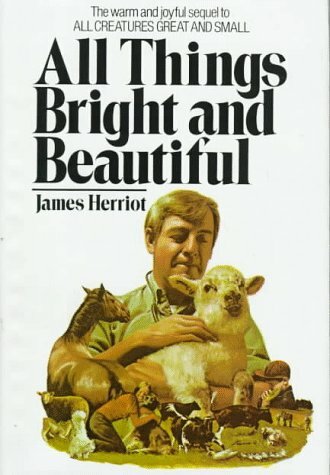 James Herriot continues the humor and the touching moments of caring for animals and adjusting to a new stage of our lives. This is Herriot's second book about his vet practice in rural England in the 1930s. This one starts just after he has married Helen and ends with him joining the Air Force (presumably just before the war?). At this point, he is trying to expand the practice (which includes brothers, Siegfried and Tristan) to include more small animals (pets). Again, another charming set of stories from James Herriot. I liked this one and didn't find the stories to be as repetitive as the last volume. I still think this is one of those things best read a chapter per night to the little ones in the house. But, as we don't have any little ones just yet, that will have to wait. This funny and fascinating read is perfect for brightening up long tedious journeys. collection of anecdotal animal storuies from the life of James Herriott (Alf Wight). Often hilarious, sometimes poignant the stories bring to life the world of pre-world war 2 rural Yorkshire. I have often laughed out loud at some of the stories and I would strongly recommend to anyone who wants a "happy" read. Charming and delightful. A tranquil, bucolic moratorium for all busy folk who long for a mental vacation. Pretty much exactly the same as All Creatures Great and Small, just with new stories. Sometimes predictable is good. who wouldn't want to become a vet in the yorkshire dales after reading this book? SUPER! Gotta be one of the best-loved series - ever! No objectionable language or sexual situations. I listen to this series once per year, usually in the winter when the short days get depressing. These four books were the first I read from the adult section of the tiny town library I grew up with. Still remember them fondly - still don't want to be involved in animal husbandry or to have a pet. That universality of appeal is a large part of their genius. Read in its entirety to my infant, who I expect now to become an expert in 1930's veterinary medicine. I discovered Herriot's books several years ago. He has since become my all time favorite author! I have collected all of his adult books in hardcover and purchased all of the childrens works for my children. Wonderful storyteller for animal lovers. You cannot go wrong with any one of his books.